Like praying out loud, talking about my faith with others is hard. When I share something on my blog, it is thought-out and edited. I often type whatever I’m thinking or feeling and then come back later and shine it up. That’s what most writers do. That’s why writing feels pretty safe for me. But talking about my faith? Yikes. That feels the opposite of safe. That feels reckless and scary and like I’m probably going to mess it up. I live in this place of fear that tells me I won’t know the right words at the right time and will do more damage than good. I like this scary place and don’t want to leave, mostly because I am lazy and comfortable here. But one of the things that God has been pushing me to do lately is talk about my faith. He’s using a few people to show me that and it feels weird to consider getting in front of others to share my story and God’s story. But it feels even weirder to know that my students are bringing up God and asking me questions. When I graduated with an education degree, an older teacher-friend said, “You can’t talk about Jesus in your classroom, but you can put a cross on your desk, have your Bible sitting out, and just let them ask you about it.” I never went that route because that is pretty much the opposite of how I do things (also, I’m pretty sure I do not own any decorative crosses…does that kick me out of the club?) and I wanted things, if they happened, to be a little more organic. And a few weeks ago, things happened. One of my classes is a group of really low, struggling readers that get some intense reading interventions in my room. Because of their need, the class size is extremely low (like seven kids total) and we’ve established a pretty nice rhythm for our time together. Recently, they were getting their laptops out and someone asked a question about God which lead to another question and then to another one. They were asking pretty typical questions: Who made God? Doesn’t everyone go to heaven? And a bunch of other questions that I can’t remember right now. But I had answers. I said things I didn’t know I knew, in a way that invited them to ask more and hopefully spurred on some dialogue later at home or internally. I remember sitting through this five minute discussion telling God: I don’t know what is going on right now, but thanks for giving me the words. It wasn’t scripted and it wasn’t perfect, but it was what those kids needed and it was the Gospel. In a public school classroom. In the middle of a normal day. God did that. I don’t know what work he’s doing in those kids’ lives, I probably won’t ever see that come to fruition, but as the conversation died down and everyone got to work on their activities, I sat there in awe of a God that let me be a part of that scene. In awe that he had equipped me even though I always feel ill-equipped and he gave me the words to speak that someone else needed to hear. It wasn’t earth shattering, but the works he’s doing in me, it was pretty evident that day. He wants to use me, you, us and we need to be willing to be used. We need to prepare to be used, we need to put in the work so he can use us. 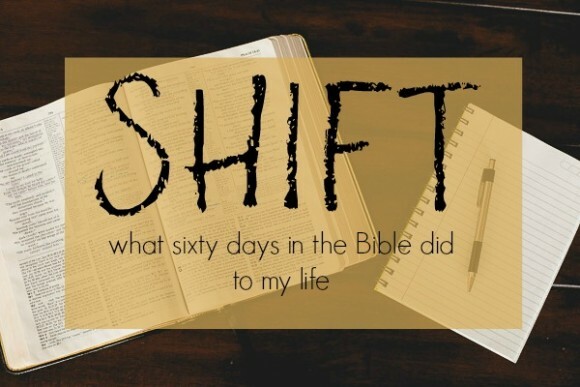 Sixty days in the Bible prepped me for that shift in my classroom. What could he do with you in sixty days? Thank you for sharing your feelings about talking about God and the experiences that you’ve had with your students. God uses His children at any given time to plant or water a seed of salvation. Continue to allow Him to use you because you never know how many lives you may touch or even save by sharing the Gospel and your testimonies! -Shalom!